Whose advice can you trust? It's complex and confusing but you cannot wash your hands of getting an idea of whom to trust because a mistake can be extremely costly, as in having your retirement savings wiped out. There are titles galore in the financial and investment industry that we individual investors must deal with. Some titles mean something, others are just fluff to impress us. The key idea is that only a few select people we might deal with are obliged to act first and foremost in our best interest, what is called behaving according to fiduciary duty. 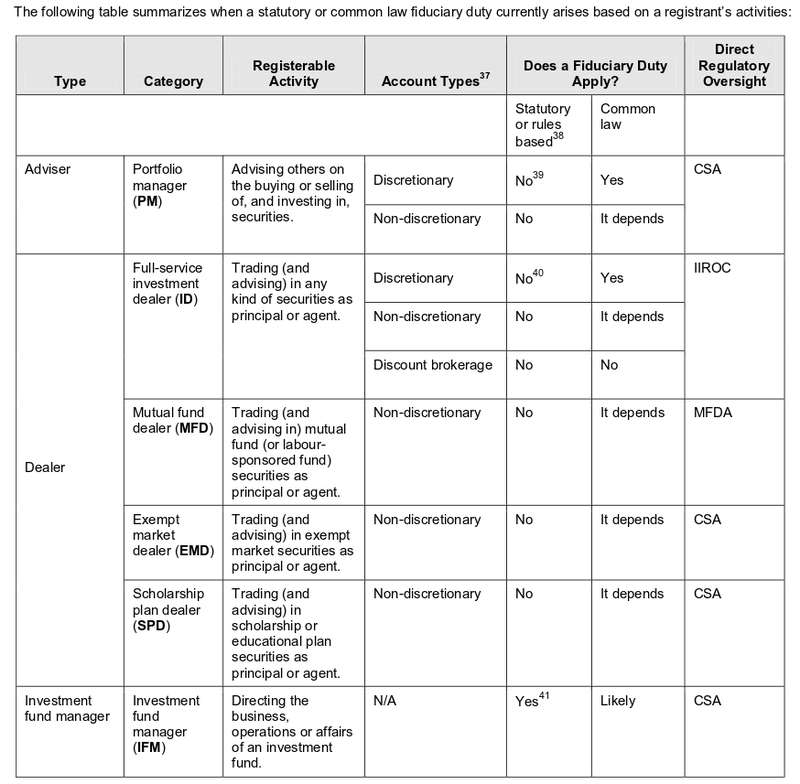 Most are held to a much lower standard, such as suitability, for instance in the Mutual Fund Dealers Association Member Regulation Notice on Suitability. That allows the industry professionals to behave with great latitude and often in their own best interest, mostly as salespeople, as long as their "advice" is not outright fraudulent or misleading. 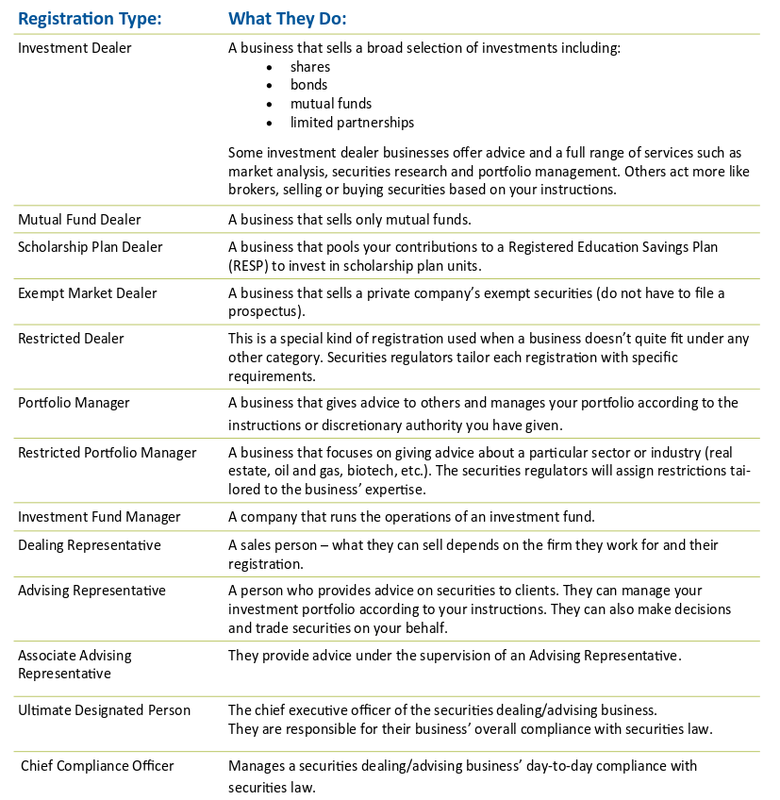 1) Canadian Securities Administrators Understanding Registration, a one-page list of all the types of people and firms that can sell or offer advice on securities (mutual funds, ETFs, stocks, bonds). 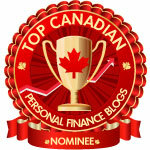 Acknowledgement to the Small Investor Protection Association, where I found this link. 2) Canadian Securities Administrators Consultation Paper 33-403, The Standard of Conduct for Advisers and Dealers: Exploring the Appropriateness of Introducing a Statutory Best Interest Duty when Advice is Provided to Retail Clients, a 37-page legalistic, technical document (why is it that such important consumer information is only to be found buried in such a user-unfriendly place?). Page 9 of the pdf contains the following chart; most of the entries in the fiduciary duty columns have a No, few a Yes and several It Depends. What is your firm's and your personal registration category? This is the first question to ask. Check the registration here. If the answer is "not registered", run for the hills! Only three categories of individuals matter. Ninety percent of people who call themselves financial advisor, investment advisor, financial planner, wealth advisor or some variation of such are Dealing Representatives, which as we see from the charts, are actually salespeople selling mutual funds. Caveat emptor! Assume they will not necessarily provide recommendations or plans that are best for you (except in Quebec where they are obliged by law to always act in a client's best interest). Advising Representatives and Associate Advising Representatives almost all work for Investment Dealers or Portfolio Managers. If they have explicit authorization to buy and sell in your account i.e. a Discretionary account, they have a clear responsibility to act in your best interest (the Yes entries in the second table). Of course, that does not negate human nature and some bad apples might still do lots of trades to generate extra commission income for themselves. The "It Depends" situations are very problematic for the individual investor. You have a Non-Discretionary account and still have final say on buying and selling. But you may be reliant on the advice given, which may mean you can or cannot count on that advice being in your best interest, depending on how the five determining factors (vulnerability, trust, reliance, discretion, professional rules or codes of conduct) cited in the CSA consultation paper pan out. In the case of dispute, usually when it's too late and and bad things have happened to the investor, the only way to find out for sure is to go to court at great cost of money, time and effort. The ambiguity, which usually works to the benefit of exploitative abusive firms and investment professionals, is a big reason for the long-standing but so far unsuccessful push to have a much broader best interest fiduciary standard imposed on the investment management and advice industry. Therefore, as a pre-cautionary rule of thumb, assume the "It Depends" will not necessarily provide recommendations or plans that are best for you. For all my dislike of the provincially-partitioned investment regulation in this country, I wish the other provinces and the CSA would do what Quebec has done and clear up the ambiguity by statutory imposition of the best interest fiduciary standard. A source of much un-necessary confusion is the proliferation of so-called financial certifications and designations, some much flimsier than others. Even for the more substantial ones amongst those listed here on the IIROC site, there is a wide range of best-interest related clauses in the codes of ethics or conduct. Trolling through any one of them to know the exact legal ramifications of each code is time-consuming and of uncertain value. Therefore, ignore designations and stick to the above basic approach. That says who you should be able to trust, legally speaking. But even then, there are a few bad apples, so it is of course necessary to keep a watchful eye and be aware of a gut instinct that says something may be wrong. As for me, I know where I stand. The Discount brokerage entries show a clear No in both columns. I know I'm on my own. If I mess up my investments, it's all my fault. 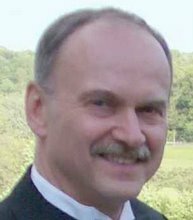 My Retirement - Should I buy an Annuity?